A protest wave in Brazil embodies new ideas of political community that challenge the country's old social practices and centralised structures, says Arthur Ituassu, a leading Brazilian scholar of social and political science and Professor at the Pontifícia Universidade Católica in Rio de Janeiro. It was, is, a political earthquake. Suddenly, on 17 June 2013, more than 150,000 people appeared on the streets to protest in eleven major Brazilian cities. The day will be remembered as the biggest political demonstration in the country since 1992, when the young cara pintadas (“painted-faces”) pushed for the impeachment of the president, Fernando Collor de Mello. In Rio alone, it was estimated that around 100,000 people went to the downtown area to walk side-by-side and sing political slogans, while a few decided to press harder and fire homemade bombs at the state assembly. The gathering also recalls the last popular assembly of this size in the city, in 1968, against the then military dictatorship. 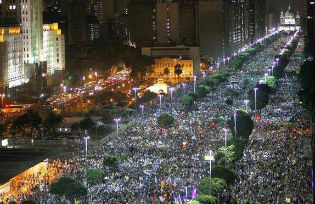 In São Paulo, an estimated 65,000 people came onto the streets. The polling institute Datafolha Research found that most of them were around 26-35 years old and had no political party preference; more than 80% said they were following the movement through Facebook. Even detailed surveys of this kind can’t figure out what exactly lies behind such a huge public display, especially when Brazil has experienced almost two decades of improving prosperity, political stability and social inclusion. In this sense, no short article can claim, metaphysically as it were, to explain “what is really happening in Brazil”. At most, one can offer some fragments that, put together, make some sense of reality. A good starting-point is the ideas and arguments that have been expressed on the streets and in social media. These represent a fresh voice in Brazil, one unrepresented in the country’s media or its political parties, and counterposed to its old, centralised social-political structures. This voice is attempting to constitute new concepts of political community in a context where at present there is no institutional path available. It is a clash of the new Brazil with the old. The story began on 6 June in the city of São Paulo. A few thousand people took to the streets, ostensibly to protest against a twenty-cent increase in the price of a bus-ticket. The paulista state police and Brazil’s establishment media, taken by surprise, were quick to define (and to smear) what was going on as a “gang riot”. Both reacted violently, symbolically or in fact, with vehement media (especially TV) condemnation and injuries to eight protesters and two policemen. This exaggerated reaction was counterproductive. The protesters rersisted this attempt to trap them in a corner by continuing their demonstrations. As they did so, so did the repressive police behaviour and the number of casualties. On 11 June, thirty-eight people were hurt, including eight policemen, and nineteen people were arrested; two days later the protests reached a turning-point, when 105 protesters, eighteen policemen and fifteen journalists were injured in the clashes. As the people poured onto the streets during these first five days, there was equally prolific mobilisation on social media, with thousands of posts being shared and linked against the repression and the dominant media coverage of the events. The social media were also used to schedule major gatherings for 17 June in the biggest Brazilian cities. This time, it would be about far more than “twenty cents”. In fact, the issues raised on all the demonstrations – though especially on 17 June – have been at once multiple and complex, vague and sparse. Yet if they are viewed in a wider context – of the Brazilian state’s historic inability to provide public services and the mass media’s over-centralisation, as well as the costs involved with the 2014 World Cup – then taken together they raise legitimate questions about both political communication in Brazil and representation in the country’s democratic regime. They may even form a coherent set of political ideas. A widespread theme of the protests, for example, links the issue of public transport, raised in São Paulo, to perennial problems in healthcare, education and public safety. This is a new version of an old debate concerning the supply-side of public issues in Brazil. The Brazilian state, deeply entrenched in the logics of Brazilian capitalism, has historically failed its responsibility to offer public benefits to a very unequal society. The now high-profile area of public transport is an example of this situation. The Brazilian state, closely linked to the automobile industry – both owners and workers – filled the cities with new cars and pollution (but no infrastructure), and gave repeated incentives to the sector as part of efforts to fight global recession. Since 2002, according to a study published in Folha de São Paulo, 1.6 million new cars (13,000 a month) have been put onto the roads of the paulista capital alone. When trucks and motorcycles are added to the account, the number of new vehicles is 2.6 million (more than 20,000 a month). In Rio and Salvador as in São Paulo, to mention only those cities, automotion has transformed itself into a daily public drama. A rising generation of young, connected and urban citizens has made a link between such concerns and others: among them successive corruption scandals involving senior politicians, and the rising costs of the global football tournament in 2014. In the latter case, 33 billion reais ($16bn) is being invested, less than 4bn from private initiative. In 2010, the government estimated that 5.4 bn rs (around $2.7bn) would be spent in the refurbishment or construction of stadiums; three years later, spending in this area alone has reached more than 7bn rs ($3.5bn). The BBC reports that South Africa’s stadiums received just $1.12bn in 2010. In addition, the young protesters have focused their criticism on parties and the media, two very important agents of political representation in connecting civil society to the political sphere. Where politics are concerned, their targets have covered all levels: the president, governors and mayors, no matter which party or side they belong to. This is reflected in slogans like “no party represents me” and “the people united do not need parties”, which were sung together with “we don’t need the World Cup, we need money for health and education”, “how many schools fit in the Maracanã?” and “Less corruption, more education”. In relation to the media, the protests’ main focus has (of course) been Rede Globo, the major private conglomerate that has dominated Brazil’s concentrated media system for decades. Besides the symbolic criticism in social media, a Globo reporter was physically harassed by demonstrators and the network’s main office was threatened by a small group in São Paulo. Also on 17 June, the powerful Globo TV – a target of the protests, and strongly criticised in social media – broadcast an editorial in the middle of its main news programme, Jornal Nacional. The statement defended its coverage, saying that it had reported the events since the beginning with “nothing to hide”, and that the citizen has “the right to protest”. The very fact that Globo felt an obligation to do this – to be “responsive”, in the sense used by the scholar Hanna Fenichel Pitkin – was a very powerful symbol of the effects of the protests. In fact, responsiveness became the common media tune after the storm. Columnists, journalists and politicians were all saying “I’m sorry”, with Brazil’s president, Dilma Rousseff, doing it in the most perspicacious way. In a speech on 18 June, she said that “the voices on the streets need to be heard. They overwhelm the traditional mechanisms of [representation through] the institutions, the political parties, the associations and the media”. It is too early to assess the consequences of 17 June, especially as the demonstrators have promised to continue their actions even after the transport-fare increase was rescinded on 19 June. But three things are already clear. First, the fantasy that Brazil has transformed itself into a paradise is over. It is not possible to hide anymore that Brazilian cities are now urban catastrophes, marked by gigantic traffic-jams, housing speculation and a lack of infrastructure and public services. Second, the top-down modernisation framework based on consumption and increasing economic activity is now contested. Brazilian people have shown the limits of their tolerance towards political institutions that have failed effectively to solve problems in public healthcare, education and safety.. (A placard in Rio makes the point: “It is not for cents, but for rights”). Third, the protests put in question the ability of Brazil’s political institutions to accommodate and channel the new conceptions of life articulated by the protests within Brazil’s political community. The protests, however they end, challenge Brazil to break with its antique, centralised social practices and structures, which include corruption, the lack of a genuine public conscience, secretive political institutions and a very concentrated media system. Against this background, these events can be seen as a clear product of the changes the country has experienced in the last two decades, including relative economic prosperity, political stability and social inclusion. It would be a far better outcome that they build on this legacy and contribute to Brazil’s renewal rather than be dragged into violent confrontations that spoil their potential.